One of the most iconic brewing companies in the world, Anheuser-Busch brings their high-end brands to the premium open bar at the 2017 Players Tailgate at Super Bowl LI. “We are thrilled about our partnership with Anheuser Busch, bringing in some of their high-end brands for our Players Tailgate VIP guests,” Bullseye CEO Kyle Kinnett said. “Their high-end brands fit perfectly with our high-end event." 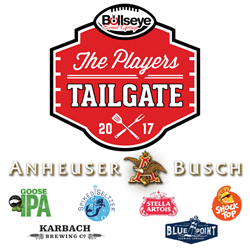 Bullseye Event Group is elated to announce a partnership with brewery-giant Anheuser Busch for the 2017 Players Tailgate at Super Bowl LI in Houston. The VIP Players Tailgate premium open bar will be available to all guests from 12 p.m. to 5:30 p.m. CT, on February 5, at Mike Calvert Toyota in Houston. Located just 1.5 blocks from Super Bowl LI host NRG Stadium, the 2017 Players Tailgate is the place to be on Super Sunday. With over 30 NFL players and some of the biggest celebrities, Bullseye’s 2017 Players Tailgate at Super Bowl LI will be the biggest and best pre-game tailgate in Houston. One of America’s favorite chefs, Guy Fieri, will be returning to create the VIP menu, joined by chefs Eddie Jackson, Aaron May, Douglas Rodriguez, Reno Henriques, Rodolfo Valdes and Pete Blohme. Entertainment at the 2017 Players Tailgate at Super Bowl LI will be provided by 2017 Players Tailgate emcee and ESPN SportsCenter host Jaymee Sire, and world-renowned DJ for some of the most iconic brands such as the Miami Heat, Target and more, DJ Irie.